Although administratively today in West Sussex, the village of Ashurst Wood formed part of Forest Row in East Sussex when that was formed out of the parish of East Grinstead, then in also in East Sussex. 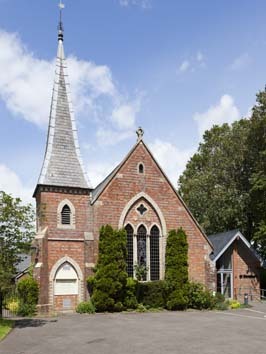 This followed a process lasting nearly 40 years as the present Forest Row church was opened in 1836 as a chapelry before becoming a district within the parish in 1850 and a full parish about 25 years later. The village of Ashurst Wood within the newly formed parish shared in the growth in population and prosperity that followed the opening of two convenient railway stations, first at East Grinstead and then at Forest Row. By 1884 a small mission room was opened to the design of L W Ridge (Elleray 2004 p2). This was built of brick rather than the more frequent corrugated iron with little beyond a single bell in an extension of the gable to indicate its purpose. It served the village until 1979, but its inconvenient location at one end of the village, together with its small size and wider structural problems made a replacement desirable. A solution was at hand since there was a Congregational church nearer the centre which had then closed. This dated from 1859 and has been attributed to ‘Habershon’ (ibid) who must be one of the Habershon brothers, though the source of the attribution is not given. For whatever reason the Congregational church was a more impressive building and its purpose is immediately apparent. It is approached from the east and has a tower and slate-covered spire of modest proportions, actually lower than the body of the church. The material of the exterior throughout is simple polychrome brick and there is a rather odd east window which is undeniably gothic in form, but consists of three equal lights beneath what might be likened to a solid tympanum containing one small quatrefoil. Inside, the church has the kind of roof that is associated with architects like either Habershon, with rather spindly timbers already old-fashioned by the time it was built. The spaces between have been plastered and the space has adapted well to its present purpose by G Ralph from 1977-79 (information from Elizabeth Williamson). 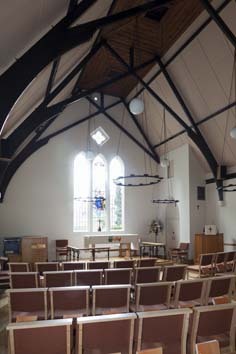 Chairs have replaced the pews that were no doubt there originally. 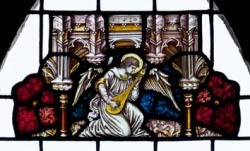 Glass: (East window) The centre light contains a figure of the virgin in prayer and above it a small rectangular glass panel showing an angel playing a musical instrument. In both cases the artist is unknown but they are of some quality. It is probable that they were installed here after 1979.